Workforce is an industry-leading cloud-based handyman software for businesses that operate in the field. Our software helps you save time and money with streamlined job management processes that were designed with field service teams in mind. Workforce helps keep things simple while improving the delivery of your services. Modern tradesmen need job management software that works for their company’s needs. Take your business to the next level with cloud-based trade management software from Workforce. With Workforce, you can spend less time on paperwork and more time delivering effective services. 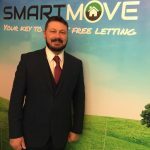 There’s no reason for tradesmen to get left behind as the world moves towards a digital future. We’ve designed software that lets you make your days more productive, whether you’re delivering the services yourself or managing a team. Handymen are always on the go, so you need a job management tool that can keep up with you. 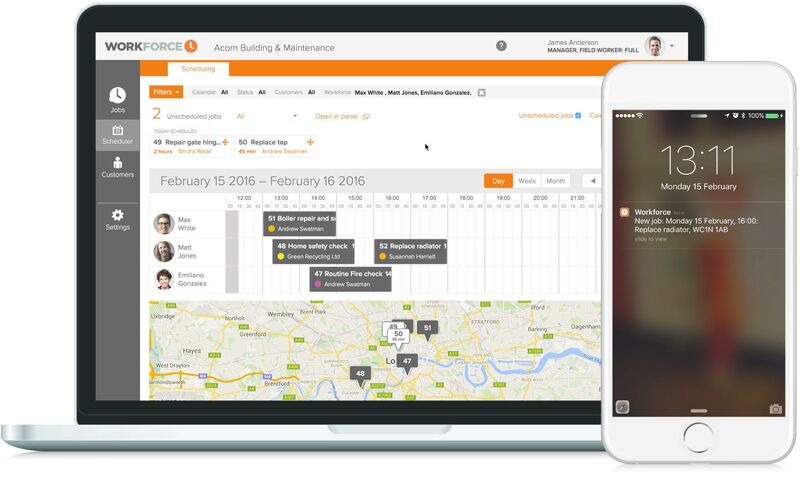 Workforce’s handyman scheduling software helps make life easier for service providers who are always on the move with cloud based technology. Whether you’re lucky enough to benefit from an office or not, scheduling new jobs for your handymen is simple and intuitive with Workforce’s admin console. Your field team will automatically receive a notification on their mobile app for every new job they are assigned that will alert them to all the job details they need to know. Because Workforce doesn’t rely on an internet connection to work, handymen are kept up to date no matter where they may be. While carrying out work, your field team are given the ability – as assigned by the office staff or manager in the admin console – to record data such as photos and signatures via the Workforce app. As our handyman scheduling software is cloud based, this information will be synced back to the administrative and management teams instantly. With a whole team of field workers moving about at any given time, staying on top of managing your workforce can be an uphill battle for providers of handyman services. Workforce is designed with the needs of field service teams in mind, and comes with unique features to make your working life easier. Scheduling new jobs is fast and intuitive in Workforce. Our handyman scheduling software uses common sense, visual tools like drag and drop and GPS tracking systems to help office staff and managers make smarter decisions and reduce travel times between jobs. What’s more, the GPS tracker also helps you monitor timekeeping and productivity more effectively as your field team move between jobs. A key part of better workforce management is trusting your staff with responsibilities that make sense and improve productivity across the board. 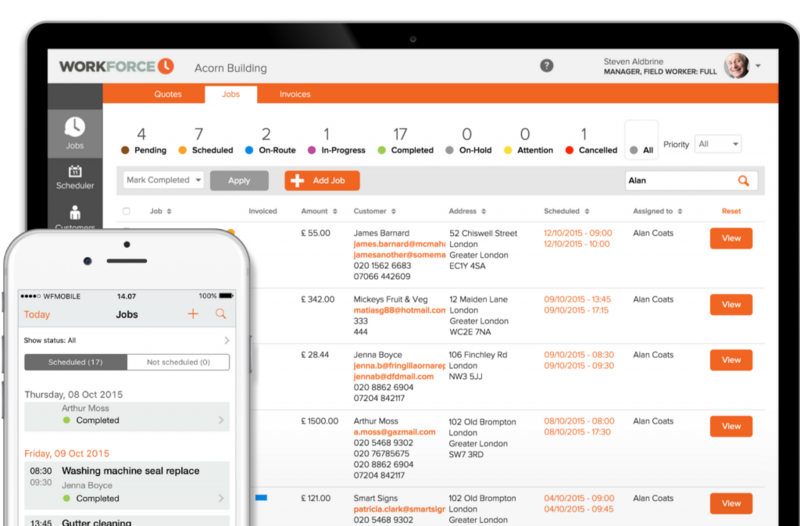 Through the admin console, office operators and managers can give handymen the ability to sign off jobs onsite, complete with customer signature and without the need for hefty and time-consuming paperwork. Workforce is designed to be simple to operate for any user. With straightforward tool, both your admin and field teams will find using our handyman scheduling software and all of its job management capabilities a breeze without the need for excessive training. If they get stuck, it’s easy to ask us questions from within the app or access one of our many resources, including “how to” videos and guides. Workforce.FM makes life easier for Handymen by simplifying and streamlining job management and field service operations. Our real time platform lets you schedule, allocate, track, quote and invoice jobs seamlessly. Instant photo and signature capture means Handymen can do their work without worrying about paperwork. All details are synced and organised instantly across the Workforce.FM platform, keeping field workers and office-based staff up-to-date at all times.